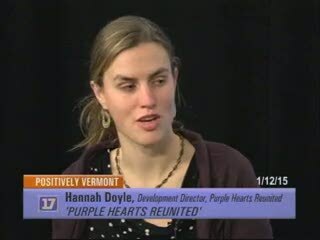 Host Dennis McMahon speaks with Zachariah Fike, Founder of Purple Hearts Reunited and current Captain in the Vermont Army National Guard, as well as Hannah Doyle, Development Director for Purple Hearts Reunited on the evolution and mission of the organization. Purple Hearts Reunited was established in Vermont in 2012, locating lost or stolen Military Medals and returning them to Veterans or their families in order to honor their sacrifice to the nation. To date, Purple Hearts Reunited has conducted more than 100 returns and is currently working on over 200 lost medals that need a home. If a Veteran or family cannot be found, a home of honor is located for the medal, such as a military museum. Purple Hearts Reunited also takes time to enroll these heroes into the Purple Heart Hall of Honor and has successfully enrolled over 1000 recipients.